We are honored to have once again achieved Oracle Validated Integration with Oracle’s JD Edwards EnterpriseOne. This achievement further reflects our commitment to helping customers drive more business value with Oracle’s JD Edwards product. Circular Edge, a Gold level and Cloud Standard member of Oracle PartnerNetwork (OPN), today announced it has achieved Oracle Validated Integration of Smart Scheduler 4.0 with Oracle’s JD Edwards EnterpriseOne 9.2. To achieve Oracle Validated Integration, Oracle partners are required to meet a stringent set of requirements that are based on the needs and priorities of the customers. Circular Edge’s Smart Scheduler is an advanced batch job scheduling tool made specifically for and built within the JD Edwards toolset. By gaining more control of batch job processing with Smart Scheduler, customers save time and money and operate with greater efficiency. 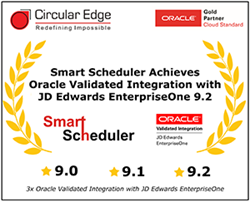 Smart Scheduler had also achieved Oracle Validated Integration with JD Edwards EnterpriseOne 9.0 and 9.1. Watch a Smart Scheduler demo and read customer success stories here. Circular Edge, started in 2003, is a full-service Oracle JD Edwards and Oracle Cloud service provider. We work with a single point of focus—to help our clients enhance their operational efficiency, customer relations, and profits. Being a resolutely customer-focused company where the interest of the customer dictates every strategic decision, we have built the most diverse Oracle JD Edwards and Oracle Cloud resource pools. For more information about Circular Edge, visit http://www.circularedge.com. Oracle Validated Integration, available through the Oracle PartnerNetwork (OPN), gives customers confidence that the integration of a complementary partner software product with an Oracle “on-premises” Application has been validated and the products work together as designed. This can help customers reduce risk, improve system implementation cycles, and provide for smoother upgrades and simpler maintenance. Oracle Validated Integration applies a rigorous technical process to review partner integrations and partners who successfully complete the program are authorized to use the “Oracle Validated Integration” logo. For more information, please visit Oracle.com at https://solutions.oracle.com/scwar/scr/AboutPartners/validated-integration/index.html. Follow Circular Edge on LinkedIn and Twitter.